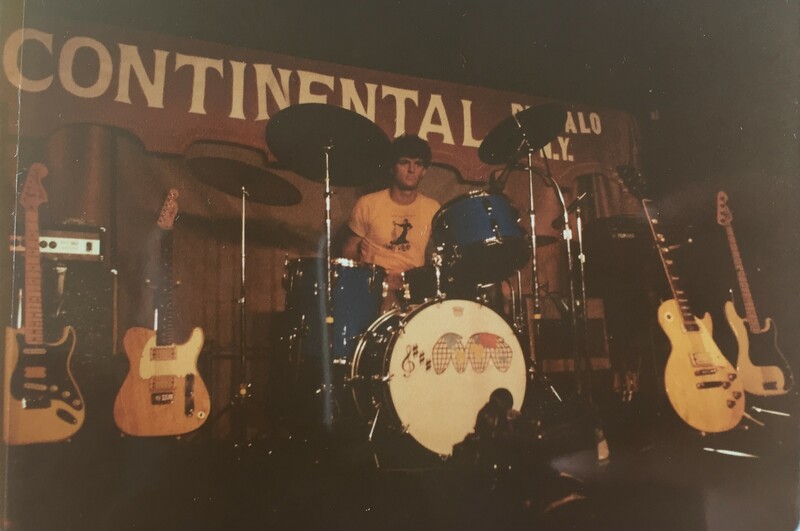 Steve during sound check at the Continental in Buffalo, NY. He appears to be wearing a T-shirt from Willard Hall at Northwestern University which quotes Women's Christian Temperance Union founder Frances Willard: "Lips that touch liquor shall never touch mine." As mentioned in the Bands page, the Buffalo gig was our next to last gig on the 1981 tour. The Continental was bustling the night we played there. There were two floors, with live bands on the ground level, and a DJ and dance floor upstairs. We were still pretty amped by our success in New York, and were having a lot of fun during our set. Towards the end of the show, I let Mitev play a guitar solo on my guitar. If we hadn't known better, we would have thought it was self-parody. But he was playing like he was center-stage in a packed Madison Square Garden, loving it, and we all had fun. After the set, we learned that two members of Rick James' Stone City Band were in the house. We knew they were based in Buffalo, so we sought them out. The two of them were holding court in a booth upstairs with an instant entourage. They had ordered champagne and passed around cigarettes that were not tobacco. They were very positive about our set, and bought us drinks, which we definitely drank. There was much dancing and partying. Eventually I heard that Phil got sick - which I had never witnessed - from overdoing it, so we ended the night. It was once rumored that a video had been made of our performance that night. If so, that would be the only live video made of us besides an early Front Lines video made in Studio 22 at Northwestern in late 1979 or early 1980. None of us have a copy of either that I know of. We covered two songs in Studio 22, "My Generation" and "Summertime Blues." I recall having long hair and jumping a lot. The late Steve Price, who went on to work visual effects for Star Trek: TNG, Ghost and Jurassic Park before succumbing to cancer, was a roommate of Phil and mine when we lived on Judson Avenue in Evanston in 1982. For a Northwestern University video class project he created a video for "Night Napalm" from found footage - news reports, film clips, video games - without the band shown. I do have a copy of that. The Continental gig may have set the bar for hedonism and rowdiness for us. After all that, Detroit was a distinct letdown.